Southern California is lucky to have Domenic Priore, 45, as a native son. The author and documentary filmmaker has focused his considerable energy on documenting the heyday of the Sunset Strip music scene and Beach Boys hagiography resulting in books like his latest "Smile: The Story of Brian Wilson&apos;s Lost Masterpiece," which can be considered an adjunct to the documentary on Brian Wilson called "Beautiful Dreamer," and his upcoming book "Riot on Sunset Strip: Rock &apos;n&apos; Roll&apos;s Last Stand in Hollywood 1965/1966." Today, we&apos;re running an interview with the author himself. 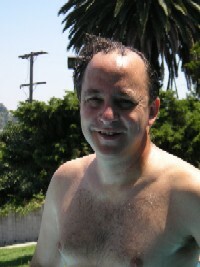 Tomorrow, we will run an LAist Interview with Domenic as if he were a resident on the Sunset Strip in 1966. Domenic will be discussing "Smile: The Story of Brian Wilson&apos;s Lost Masterpiece" at Vroman&apos;s Bookstore in Pasadena next Saturday, July 23, 2005 at. 3:00 PM. He&apos;ll be joined by Van Dyke Parks, Danny Hutton & Wilson collaborator Tony Asher at the reading. Go early, the reading at Book Soup last week attracted a large crowd. I was born in Pasadena, and grew up in Monterey Park during the &apos;60s. East L.A. was a prominent influence; we celebrated when we heard Thee Midniters&apos; "Whittier Blvd." I recently did a story about the early rock &apos;n&apos; roll shows I witnessed in Monterey Park at Art Fein&apos;s website, including pictures of my band from 1969 (age 9!)... saw Surf bands... and Janis Joplin w/ Big Brother & the Holding Company. Read all that at sofein.com. I&apos;m a native, really, but moved out of L.A. for over 10 years to experience living in San Francisco and New York City. A great deal of my subject matter as a writer and documentarian is about L.A., because I feel it was fantastic at certain times, and it always gets short shrift. So currently, research here is crucial for me. How did you come to write "Smile: The Story Of Brian Wilson's Lost Masterpiece"
in London, people from Sanctuary Publishing, who had looked me up while I was in California, had me over to their office and asked me if I'd do a straight, text-oriented book on Smile. There'd been a nice one on "Pet Sounds" by Chuck Granata, so I figured it'd be a cool thing to bookend that with... plus, "Smile" is really a lot more interesting of a story than "Pet Sounds." It's Icarus, all over again, on the 1960s L.A. rock 'n' roll scene. In commencing this project, what surprised you the most from doing it or researching the book? The fact that there is a missing tape of the 1967 production of "Surf's Up" in a vault somewhere, and we may now know where that is. Of course, this was the key song from Smile that was later re-assembled by the group in 1971 when they really needed the Psychedelic credential for early F.M. underground radio. What impressions you did get of Los Angeles during the 60s and 70s when Smile was being recorded? listener. There was so much going on, one had to share to keep abreast of all the thrills to be had, and the best thrills were truly musical then. What does Brian Wilson think of the project? burns too. Brian offered a foreword to SMILE: THE STORY OF BRIAN WILSON'S LOST MASTERPIECE, and I'm truly grateful for that. Best of all, the Wilsons have allowed me to be an objective journalist and speak the truth, with their blessings. I really appreciate that. Of course, the Smile tour, CD and DVD were all successful in their presentation of the original work, and if I'm laudatory, its an honest reaction to the results. What does "Smile" reflect about Los Angeles at that period of time? There was a huge turn toward environmentalism during the mid-'60s L.A scene. I own this paperback from 1966 called THE DESTRUCTION OF CALIFORNIA, and if you watch any old Variety shows from that period, the big joke about L.A. for Milton Berle, Jack Benny and all those people, was the smog. The Folk-Rock movement, instigated by the Byrds, really set "green" album covers in motion. as "The Elements". Beautiful stuff, which is now Brian's favorite part of the Smile shows. The Beach Boys are such an integral part of the creation of Los Angeles/Southern California Los Angeles mythology, what do you think Brian Wilson's personal experience says about living in LA during the 60s? internationally unique ball (see their early albums ALL SUMMER LONG or SURFIN' U.S.A.) but then again, once sucked into the Hollywood vortex, self-control had better be an issue. Brian Wilson reached the heights of what creativity is possible here, and what I mean by that is that his music by the time of PET SOUNDS and SMILE is as cinematic as any film. SMILE, especially, is aural, pictorial, vivid, and of course, evokes Psychedelia, but more in leauge with the British Psychedelia of The Pink Floyd's "See Emily Play" or the Beatles "Being For the Benefit of Mr. Kite" than the elongated "jam" sessions favored by Haight/Ashbury heads. This kind of Psychedelia was more about 3D audio, which Brian mastered brilliantly on SMILE. What does the album, "Smile," reflect about Los Angeles, then in the 60s and now, as we listen to it in the 21st Century. used to be the Jazz Workshop). It's all cool, but in general, giddyness is frowned upon in the Bay Area, even now. Where is the best place to write in Los Angeles? huge fan of the Modernism architects, and I like being near that aspect of L.A., where you can see the Art Deco stuff, and watch as the buildings evolve into Modern. That's my kick, and inspiration. Where is the worst place to write in Los Angeles? Any LA café where you had a bad experience writing? it's beautiful in there. Editing on the subway is really cool because you're in there with the everyday people, and you can be less full of your self... which is necessary for a good edit. What's your preferred mode of transportation? How often do you ride the MTA subway or light rail? hessian** thing during the '80s, which is my pet peeve about L.A.... I just left. I didn't own a car for 7 years while I lived in New York and San Francisco, and really wish I had that option here today. I returned to college for a while, and rode the Red and Gold line up to Pasadena all the time. I would never go downtown with a car. So that's why Union Station and Olvera Street have become my personal favorite writing hangouts, outside of my pad. What's your favorite movie(s) or TV show(s) that are based in LA and why? a Phil Spector-type '60s record producer/mogul. Too, too much. The Sick and Twisted Players in San Francisco did this with Connie Champagne playing the lead charachter... that's what I mean when I say that San Fran has a good, non-Grateful Dead worshipping scene now. The movie was released in 1967, but it's 1966 all the way. My favorite television shows... ever... were the local Go Go shows HOLLYWOOD A GO GO and GROOVY.... the former was shot to look like it was Gazzarri's 1965, while the latter was shot out by the Santa Monica pier with this great, screaming DJ host Michael Blodgett and a very Mod bikini contest every day of the week, for 86 episodes in 1967. The bands on those shows were unreal, and I really don't think those two programs have been topped, anywhere. Best LA-themed book(s) and why? but you have to read it to understand why that Janis Joplin analogy makes total sense. Share your best celebrity sighting experience. Universal Studios back in the late '60s/early '70s. That, and talking to George Harrison for over an hour once about cars, the L.A. highways and the tradgedy of the Red Car rail line, which he had no idea about. George dug the whole political back story on that, and we were engaged in a real good conversation that I'll never forget. Coolest guy I ever met, for sure. What's the best place to walk in LA? Out the door of Manuel's El Tepeyac in East L.A., after finishing the Okie Burrito. Either that, or on a surfboard that's 9 1/2 feet long... in the water, of course. It's 9:30 pm on Thursday. Where are you coming from and where are you going? Depending on who's playing, jumping up and down and yelling "MODS! MODS! MODS! MODS! MODS! "* or cuffing my jeans wearing a wild Western shirt... either way, my haircut suits both a Mod or a Rockabilly show, despite their exclusive hatred of each other.. but I prefer the Exotica/Lounge stuff and recently have gone from my pad on Rossmore Ave. to Tangier to see this French singer Keren Ann, who somehow crosses Chet Baker, Nico, Francios Hardy and "Strawberry Fields Forever"-era John Lennon, at Tangier in Los Feliz. I've been there twice to see her sing recently. Would you have wanted to live in Los Angeles in 1965-66? Why or why not? mean, it was really unique and fun place to be, and it would be impossible to re-create L.A. that good again. A friend of mine put it best when he said "You'll never be able to re-create the opening credit film at the beginning of THE BIG T.N.T. SHOW in a million years. What's your beach of choice? Crescent Bay at Laguna Beach, for the body surfing angles there, and the beauty. I refust to let Orange County go Confederate, in my mind, because I remember it from the '60s when it was our local L.A. getaway place. What is the "center" of LA to you? The Moulin Rouge during the recording of THE BIG T.N.T. SHOW, i.e., Sunset & Vine. If you were forced to live in a neighboring county, which would you choose? Ventura County is a wussy answer. If you could live in any neighborhood or specific house in LA, where/which would you choose? I might choose to live in the El Royale on Rossmore. I'm through with "yardwork". What is the city's greatest secret? Its lost KHJ rock 'n' roll television shows. Los Angeles is often stereotyped as a hard place to find personal connections and make friends. Do you agree with that assessment? Do find it challenging to make new friends here? Yes, because you have to weed through a lot of really out-of-touch corporate people posing as "artists". I don't find it challenging to make new friends here, but I've got a native's radar. A lot of people come here from other cool cities, and that helps. Drinking, driving. They mix poorly, and yet they're inexorably linked. How do you handle this conflict? Drinking, eh, gives me a headache. I go to drinking establishments to hear music. Describe your best LA dining experience. (see Manuel's El Tepeyac reference, above). What do you have to say to East Coast supremacists? New Yorkers have a point, of course, but if they miss what's cool about L.A., I once again refer them to El Tepeyac. Or Crescent Bay in Laguna Beach. See, our culture is more aligned with Hawaii, theirs is closer to Europe in spirit. That's a huge cultural difference that they just do not understand, and that's what I get into a discussion about. Do you find the threat of earthquakes preferable to the threat of hurricanes and long winters? Where do you want to be when the Big One hits? Kansas City, because it will hit there ten years later. In your opinion, what's the best alternate route to the 405? I go over the hill around there at Beverly Glen, but the best thing to do is to avoid going to the Valley at all. Really, it's doable. Just tell your Valley friends "are you coming to the city?"... that seems to work for people who live in San Francisco... that's what they tell their East Bay friends. Seriously, how many New Yorkers trek into New Jersey all the time? The Valley offers nothing to a Hollywood, or a Pasadena/East L.A.-area resident. Other alternatives to the 405 would be La Brea, then Century, to get to the Airport, and of course Venice Boulevard, Olympic Boulevard and Pico lead you to streets on the West Side and the South Bay that can get you anywhere, North or South. The 405 is to be avoided at all costs. County, or Fenders in Long Beach. The hessians hated Punk Rock, could not stand how it had replaced "Rock" and did everything they could to eliminate it from the Hollywood music scene. They took over Whisky a Go Go (a graffito near there said WHISKY NEEDS PUNKS in protest when the club banned Punk and started to bring in Metal in its place... along with Pay-to-Play for those suckers). Any diversity in the L.A. music scene died with that during the '80s.